Fabbster kit - CNC gép, kábelvédő, fúrótömlő; Kutenich Kft. The Fabbster kit is a small form factor 3D printer device geared towards manufacturing of work pieces of up to about 23x23x21cm in dimension. The Fabbster kit prints three-dimensional objects from different plastic materials. The device comes in a compact box as a partially assembled construction kit. The kit can be completely mounted within 2 hours. Fabbster combines high quality 24V electronics and stepper drives guided by linear ball bearings with stainless steel rods and high-quality plastic comonents reinforced by fiberglass. Beyond these features that make Fabbster stand out from other small form factor 3D printers, Fabbster also introduces a new innovative technology for melting the consumption material, called Stick Deposition Moulding (SDM). The extruder of the printer is fed with special sticks developed by the Fabbster team. These sticks are characterized by a cogging-shape on their sides. They are made by injection molding technique and thus are much more precise than the round wire used by other 3d printers. The result is a precise dosage of the melt. This innovation offers major advantage over circular filament that is subject to slip. Stick Deposition Moulding (SDM) lets you print objects with optimal material properties. 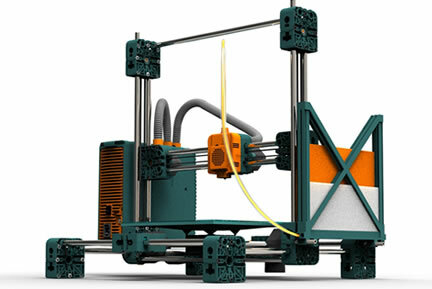 The Fabbster kit comes with software for data processing and 3D printing. Analysis and repair of components, production of standard models (e.g. text, cubes), scale, crop and more. Before printing you can choose between predefined settings (fast, detailed etc. ), or set the optimal parameters of your components manually. Transfer your data to Fabbster via USB or SD card or steer extruder head and building platform with keyboard and mouse. Please tell us your needs, so that we can recommend the machine and materials that best fit your application. The data on the homepage are informative. Please request an exact specification from us as soon as you need that in your purchase decision process.